Metropolis LA, developed by Greenland USA, is a much-anticipated downtown Los Angeles mixed use property consisting of residences, retail, and a hotel. 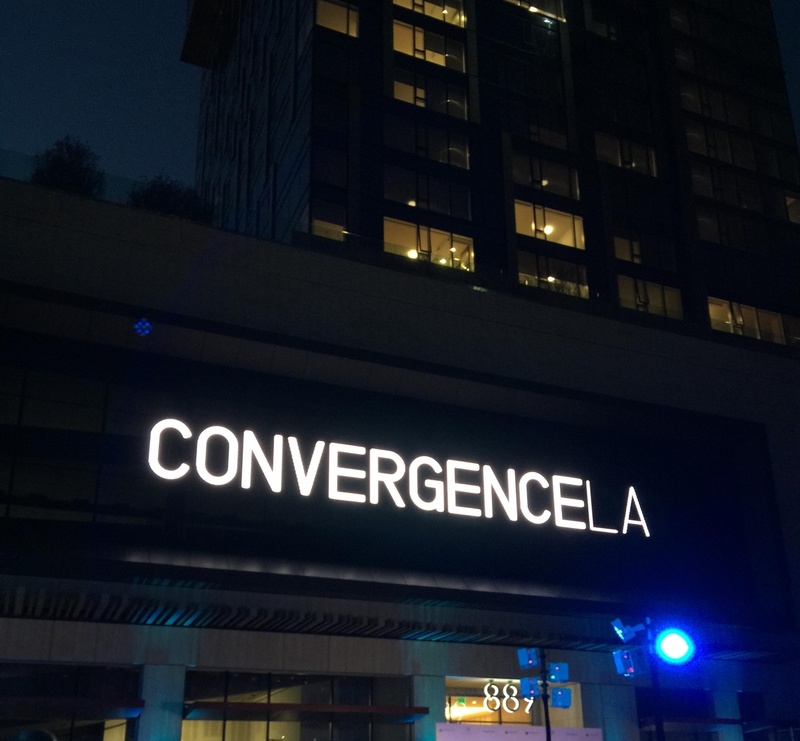 Though the second phase is still under construction, Phase I (one residential tower and the Hotel Indigo) has been completed and on Thursday, March 2nd, Metropolis activated its 1,400 sqft LED video display installation titled ConvergenceLA - the first of its kind in Los Angeles. Burnham Nationwide is proud to have provided permitting assistance for the architectural, structural, and electrical permits for the artwork and we’d like to shed light on both this unique installation and on the growing trend of digital public art. ConvergenceLA is a collaboration between artist Refik Anadol from Refik Anadol Studio and local artist and architect Susan Narduli from Narduli Studio. It seeks to explore storytelling through a changing display and the Artist’s Statement from Anadol and Narduli draws attention to the uniqueness of the fusion between built environment, art, and technology. Highlighting the façade as a canvas that will “capture the spirit of Los Angeles and reflect back features and activities into the surrounding neighborhood,” the screen provides an ever-updating narrative of the city through gathering of data. Metropolis echoes this intent through their commentary that the display uses “real-time demographic, astronomical, oceanographic, tectonic, and climate data streams, as well as social media posts, traffic, and news feeds, to present an ever-changing cinematic narrative of Los Angeles.” The public is provided with a new experience upon each viewing and like the city, the content never remains stagnant. Burnham was able to attend the opening ceremony - watch a video of a portion of the event below. 20’ by 97’ feet, the screen is visible from the Metropolis property, Francisco Street, and by pedestrians. Active for at least 12 hours a day, there is ample opportunity for viewers to experience the piece. While the physical display is situated in a public plaza, visitors can also interact with the installation remotely through QR codes that provide access to additional content. ConvergenceLA is accompanied by a website that provides audio and visual content generated in real time from the data streams used in the installation. This places the piece at a distinctive point - harmonizing and utilizing physical space, architecture, data, and public interaction. Burnham’s LA office was responsible for securing all required permits for Metropolis Phase 1 through the Los Angeles Department of Building and Safety (LADBS) including the permits needed for the art screen installation. Through our knowledge of the Los Angeles permitting process and our expertise in new developments in the City - such as the Wilshire Grand, the tallest building west of the Mississippi River - Burnham was able to expedite approval of the structural plans for the physical screen as well as complete the required electrical permitting over the counter (a same day, no-review process) through the LADBS’s Express Electrical permitting process. This allowed Metropolis to connect the sign to power and debut the installation on schedule and to create an opportunity for the public to interact with the development’s new focal point at the Hotel Indigo’s highly anticipated opening. The installation of ConvergenceLA is another addition to the rising trend of digital installations in cities throughout the country. Many urban centers have a long history of public art but digital art - specifically of a permanent nature - is still nascent. The City of Chicago is one municipality that plans to expand their public art offerings with digital art. The City plans to use the two-block, 25-story façade of the Merchandise Mart building as a canvas illuminated with projections designed by Chicago artists. The digital installation will be the largest to date in the City of Chicago and will be visible from the Chicago Riverwalk; it will also serve an adjacent purpose and help illuminate Chicago’s riverfront. The project illustrates Chicago’s ongoing commitment to new public art and is a centerpiece of the “Year of Public Art” in Chicago. Currently helmed by A+I Architects and studio Obscura Digital, the project has been confirmed by the City and by Vornado Realty Trust, the owner of the Merchandise Mart. The illumination project is being studied for feasibility at this time and is scheduled to debut in 2018. Obscura Digital has created installations for iconic structures such as the Empire State Building and St. Peter’s Basilica in the Vatican, illustrating the variety of locales that have featured art of this variety. The inclusion of media displays alongside construction explores new ways the public can relate to built environments and promises to continue to be innovative and exciting. Burnham Nationwide looks forward to providing more insights into the Metropolis development as well into art installations like ConvergenceLA and the illumination of the Merchandise Mart as we witness how art and architecture continue to intersect.